Dozens of Brazos Valley athletes signed their National Letters of Intent. The Blinn College football team received 38 National Letters of Intent on National Signing Day on Wednesday. 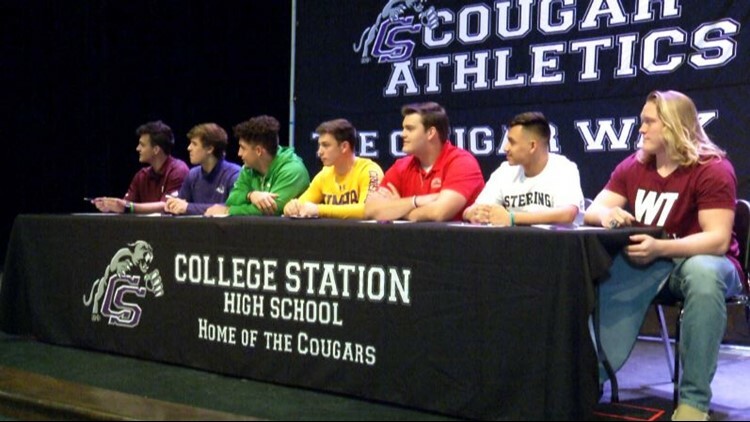 The list of offensive signees are: Jaiden Howard (QB – Crosby), Darren Battle (RB – Magnolia), Michael Gibson (OL – Friendswood), Ethan Hagler (OL – Barbers Hill), Allen Leiato (OL – Clear Lake), Xavier Luehr (OL – Morton Ranch), Stanley Mark (OL – Steele), Juan Quezada (OL – Austin), J’onre Reed (OL – Eisenhower), Jahleel Rice (OL – Judson), Gerome Henry (WR – New Caney), David Burton (WR – Clear Lake), Marquise Doucette (WR – Crosby), Jashaun Foster (WR – Sterling), D’Anthony Simms (RB – Klein), Dawson Unruh (WR – Cypress Creek), Kadrian Hammond (WR – Yoe), and Darrell Williams (WR – Denham Springs). The list of defensive signees are: Anziah Williams (LB – Brennan), Ben Langston (DB – The Woodlands), Daymond Lewis (DB – North Shore), Degiovonni Williams (DB – Houston Heights), Bradley Banks (DL – Euless Trinity), Keyon Hurse (DL – Plano), Johnathan Benjamin (DL – North Shore), Jared Esparza (LB – Gonzales), Justin Henry (DB – East View), Kelvin Mathis (DL – Brenham), Daelon Mitchell (DL – Fort Bend Elkins), Cameron Riggins (DL – Burton), DJ Sasser (DB – Hightower), Amadi Thomas (LB – Mayde Creek), Bryton Thompson (DL – Atascocita), Joey White (DB – Clear Lake), Edgerrin Williams (DE – Cedar Ridge), and Brad Williams (DE – Nacogdoches). The list of special teams signees are: Lukas Enloe (K – Gilmer) and Nick Falsone (K – San Antonio Churchill). Blinn finished the 2018 season ranked 15th in the nation with a 7-4 record after defeating then- 14th ranked Scottsdale in the Valley of the Sun Bowl. Twenty-two Blinn College football players signed letters of intent following a successful season that ended with a bowl game win. Fifteen of the twenty-two Buccaneers signed mid-year letters of intent, while seven signed today. Quarterback Daveon Boyd (Humble), defensive lineman Djuan Matthews (Houston), outside linebacker Trevor Harmanson (Dickinson), cornerback Darius Milton (Sugar Land), defensive end Adrian Johnson (Center), defensive tackle Ben Gansallo (Missouri City), and linebacker Terrance Williams Jr. (Meadow Place) signed on National Signing Day. Boyd heads to Tarleton State University after recording 250.7 yards per game, the third best average in the nation. Milton transfers to Texas A&M University-Commerce after he totaled 55 tackles on the season and was named the Sun Bowl Defensive Most Valuable. Matthews signed with the University of Hawaii, Harmanson signed with the University of Texas at San Antonio, Johnson signed with Texas Wesleyan University, Gansallo signed with the University of New Mexico, and Williams signed with Henderson State University. Mid-year signees on the offensive side included wide receivers Keric Wheatfall (Cypress) and Kristian Drake (New Braunfels), tight end Rhett Read (Buffalo), and offensive linemen Garrett Nickelson (League City), Doro Omerhi (Pearland), Travis Arroyo (Pflugerville), and Joe Oliver (New Orleans, La.). Wheatfall signed with Fresno State, Drake signed with the University of Incarnate Word, Read signed with the University of North Carolina at Charlotte, Nickelson signed with Western Kentucky University, Omerhi signed with Houston Baptist University, Arroyo signed with Texas A&M University-Kingsville, and Oliver signed with the University of West Alabama. Blinn’s offense ranked first in the nation in total offense (5,493 yards) and yards per game (499.4 yards). The offense was ranked second in the nation in passing yards (3,241). Mid-year signees on the defensive side included cornerbacks Mike Garrett Jr. (Magnolia) and Miles Banks (Missouri City), defensive ends Kristen Williams (Houston), Zechariah Hopkins (Cuero), and Amorama Noel (Humble), defensive lineman Michael Gayden (Houston), linebacker Jared Young (Missouri City), and defensive back Deldric Shields (Pittsburg). Garret Jr. signed with the University of Tulsa, Banks signed with the University of Texas at San Antonio, Williams signed with Lamar University, Hopkins signed with Tarleton State University, Noel signed with West Texas A&M University, Gayden signed with Abilene Christian University, Young signed with Southwestern Oklahoma State University, and Shields signed with Angelo State University. Blinn’s defense ranked first in the nation in sacks (55) and sixth in the nation in tackles (880).